Based on a major research project funded by the European Commission, Populism, Media and Education studies how discriminatory stereotypes are built online with a particular focus on right-wing populism. Globalization and migration have led to a new era of populism and racism in Western countries, rekindling traditional forms of discrimination through innovative means. New media platforms are being seen by populist organizations as a method to promote hate speech and unprecedented forms of proselytism. Race, gender, disability and sexual orientation are all being used to discriminate and young people are the preferred target for populist organizations and movements. 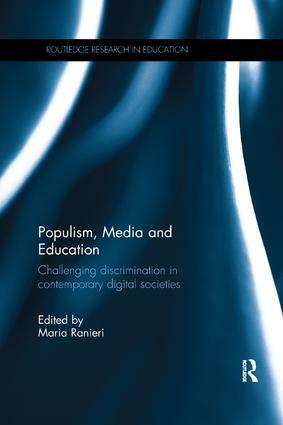 This book examines how media education can help to deconstruct such hate speech and promote young people’s full participation in media-saturated societies. Drawing on rich examples from Austria, Belgium, Bulgaria, France, Italy, Slovenia, and the UK - countries characterized by different political and cultural contexts – Populism, Media and Education addresses key questions about the meaning of new populism, the nature of e-engagement, and the role of education and citizenship in the digital century. With its international and interdisciplinary approach, this book is essential reading for academics and students in the areas of education, media studies, sociology, cultural studies, political sciences, discrimination and gender studies. Maria Ranieri is Associate Professor of Educational Technology, Department of Education and Psychology, University of Florence, Italy.